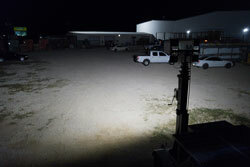 The WAL-3XFTL5LEDHD-4XWP600E-WC-E2E Portable LED Flood Lighting system from Larson Electronics is IP65 rated, vapor proof, and uses three 4-foot LED work lights with retractable cords to provide portable task lighting and three adjustable high output LED light fixtures to provide 360° area lighting. Combined, this fixture produces 26,700 lumens while drawing 2.2 amps at 264 watts on a 120 volt electrical system. This unit features a 30` line in cable and 5` line out cable, allowing operators to connect multiple units end to end for daisy chain connections within the work place. The WAL-3XFTL5LEDHD-4XWP600E-WC-E2E work area LED flood light system provides a complete 360 degrees work area coverage with 26,700 lumens of light output. This portable LED light is mounted to a powder coated frame constructed from light weight aluminum with top mounted pick eye and rubber casters. Three 28 watt retractable LED task lights mounted to the side of the aluminum frame produce a combined 10,500 lumens and provide 360° of area illumination around the fixture. Each 4-foot work light is equipped with a 50` retractable cord, can be removed from the cart for temporary task illumination, and snapped back into place onto the cart. Three 60 watt adjustable LED light fixtures produce a combined 16,200 lumens and provide additional area lighting or upward lighting. 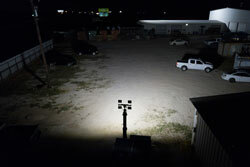 Each of these 60 watt flood lights can be adjusted independently. The LED lights within this unit produces a brilliant flood pattern of light that is ideal for illuminating enclosed areas and confined work spaces within the job site. This portable work area LED flood lighting system is comprised of three 28 watt4-foot LED task light fixtures and three 60 watt LED flood lights mounted within a portable stand fabricated from corrosion resistant aluminum with a durable powder coated finish. 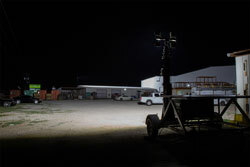 Three adjustable trunnion mounted fixtures are mounted on the top side of the frame to provide upward lighting, and can be positioned as needed by operators in the field. This flood light system can be positioned in its upright position to provide an intense flood beam covering 360° around the system, or suspended in its upright or laid down on its side positions to provide lighting within tanks and enclosed work areas. The triangle frame design provides stability for the flood system in when mounted in either position. 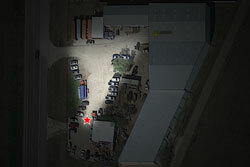 A pick-eye located on the top of the frame allows operators to lower the flood light system into tanks through man-way entries. This fixture is equipped with locking casters to increase mobility within the work environment. Each of the linear LED work lights draws 28 watts and produces 3,500 lumens with a color temperature of 5600K, which produces colors and details much more accurately than high pressure sodium or mercury vapor lamps. The LED lamp housing features machined polycarbonate handle and end cap and polycarbonate lens. Each retractable drop light is shock resistant, making it durable enough to withstand drops, falls, and rough handling. Each lamp is equipped with an LEDT8-28W-V1 T8 bulb from Larson Electronics, which produces 3,500 lumens and requires no ballast to operate. The lightly frosted lens diffuses the light and makes this bulb ideal for food safe environments as there is no glass. The top mounted LED flood lights consists of three sixty watt LED fixtures, with each fixture containing six 12.5 watt LEDs with 45° offsets to provide true 180° coverage per lamp and are housed within a waterproof housing. The cast aluminum housing incorporates integral cooling fins for efficient heat dissipation and increased LED longevity. The LED lamp assembly is protected by a shatterproof polycarbonate lens which is secured to the housing with a waterproof seal. A 1/2" waterproof connector provides a secure and sealed power connection point and rounds out this unit`s weather resistant construction. Mounting hardware consists of a stainless steel bracket and stainless steel screws to provide secure mounting and resistance to rust and corrosion. The mounting assembly provides for 360°/180° rotation to allow the operators to position each floor light as desired in the field. Included with this LED flood lighting system is 30 feet of 12/3 SOOW cord terminated in an industrial grade cord cap for easy connection to common wall outlets. Plug options include standard 5-15 straight blade plug for 110V wall outlets with ground, NEMA L5-15 twist lock plug for 125V twist lock outlets, and NEMA L6-15 twist lock plug for 240V twist lock outlets. The WAL-3X160LED-4XWP50-100-WC-E2E is equipped with a 3` whip terminated in a connector, allowing operators to connect multiple units together end to end for daisy chaining multiple units together. Operators can daisy chain up to 3 units end to end in 120 volt or 6 units in 240 volt configurations. This light is universal voltage capable and can be operated with 100-277 VAC, 50/60Hz. The LED light head retains 80% of its lumen output after 60,000 hours of use, far longer than incandescent or fluorescent lamps. The compact design and 360° beam coverage makes this unit ideal for tank cleaning and MRO applications. 2. Led lamp head requires no lamping. 3. Durable Base Mount constructed of copper free aluminum. 6. Three LED light heads and three retractable LED work lamps. 8. 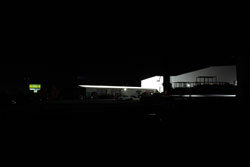 26,700 Lumens produced from only 264 watts. 9. Mercury free shock proof LED lamp light heads.